Ericssonite has a general formula of BaMn2FeO[Si2O7](OH). 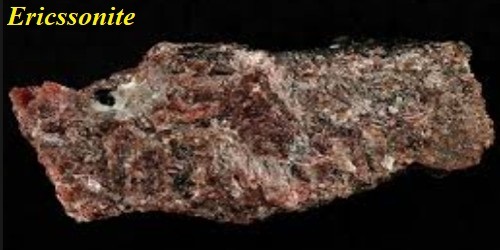 It is a monoclinic-prismatic reddish black mineral containing barium, hydrogen, iron, manganese, oxygen, and silicon. It is usually a deep reddish-black in color. It was discovered in 1967 and named after John Ericsson (July 31, 1803 – March 8, 1889), a well known Swedish American inventor, engineer and designer of the iron-clad ship USS Monitor. Ericssonite was discovered in the Jakobsberg Mine in Värmland, Sweden. Ericcsonite is monoclinic; this means it contains three unequal vectors, two of these vector angles are perpendicular while the other is at an angle greater than 90°. Optically ericssonite is anisotropic which means that the mineral has more than one index of refraction, causing light to vary in speed depending on which axis it is traveling through. Since ericssonite is monoclinic, containing three unequal vectors, it has three indices of refraction. 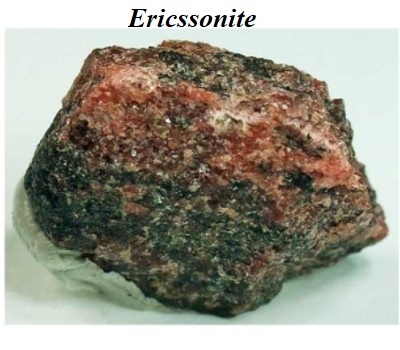 Ericssonite was discovered in the Jakobsberg Mine in Värmland, Sweden. It is only found in the Langban mine in Sweden, and usually in a metamorphic manganese ore body. Ericssonite is only found in the Langban mine in Sweden, associated with a metamorphic manganese orebody. Also, it is always inter-grown with orthoericssonite, which is almost identical to ericssonite except it contains extra silicon and oxygen in its chemical formula.